Though allowing delicious new potatoes to be swallowed whole by irresponsible amounts of mayonnaise is tantamount to spud-blasphemy, a heavier rendition is often desirable. 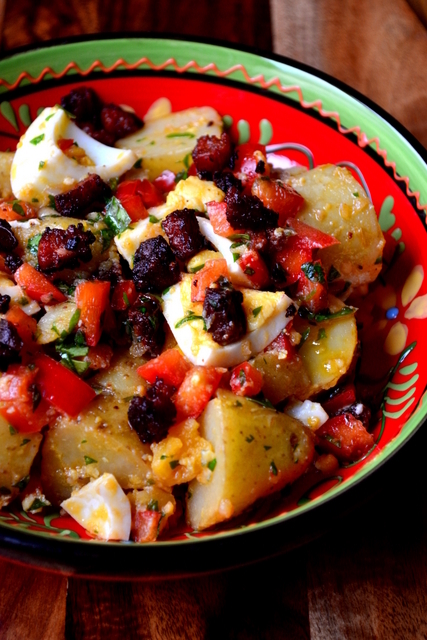 We first had this Chorizo and Potato Salad during a recent trip to Spain. Full of protein, carbs and – most importantly – flavour this satisfying salad was just the ticket having just stepped off a delayed flight. It may sound bold, but for me this is a very interesting potato salad; it’s about as engaging as food gets. Of course, its not always advisable to have so many opposing flavours and textures in one dish, but the waxy tatties, soft eggs, crunchy pepper and crispy chorizo do work. Fundamentally, this business is part of the charm of the salad and is very Spanish in its conception. As with my take on the classic egg and cress sandwich, your eggs should be somewhere between ‘soft’ and ‘hard’. If this is achieved something truly magical will happen, with the yolk combining with the paprika infused olive oil for a fabulous salad dressing. Enjoy and make sure to boil your eggs correctly! Bring your potatoes to a brisk boil in lightly salted water, cover with a lid. Meanwhile, immerse your eggs in cold water and bring to the boil. Once boiling, cook your eggs for exactly 5 minutes. Once cooked transfer them to a bowl of cold water and leave to cool. Heat the oil in a frying pan and cook the chorizo until crispy, set aside. Mix together the diced pepper, chopped parsley, olive oil (from the frying pan), paprika, salt and pepper in a large bowl. Once the Potatoes are soft through quickly rinse in cold water and add to the bowl. 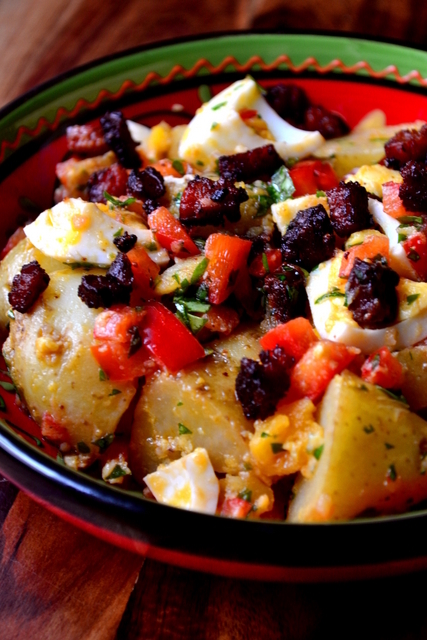 Slice the cooled eggs each into 8 pieces and add to the potatoes, along with half the chorizo. 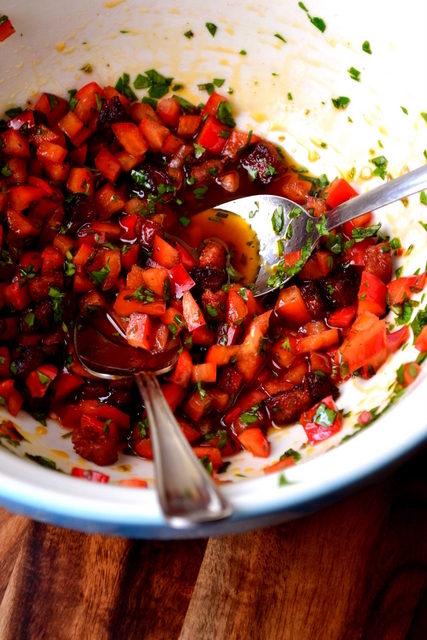 Mix everything together thoroughly and top with the remaining chorizo. Serve immediately for a warm salad. It keeps well in the fridge for 2 days. Cost: I love recipes like this because they never cost very much. Potatoes, eggs and even chorizo are never going to break the bank and yet they combine to make a truly exceptional meal (or side). In fact, so frugal is this potato salad that you can make it all for a mere £2.50! This is a wonderful salad! I have to try this. Perfect! 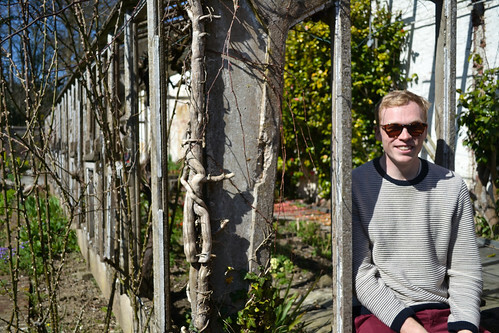 I have fantastic Spanish chorizo in the freezer and backyard eggs in the fridge – thanks Nick! PS. love your bowl – is it Turkish? Well, then what’s the excuse? It’s actually Spanish, which I suppose suits the dish. However, I have seen some similar Turkish examples. Either way, it’s a great bowl, but a bit delicate. Potatoes are my favourite food. If I were stranded on a dessert island, and could only have one thing with me? Potatoes. Hands down. If you threw in some chorizo and eggs? Well, I wouldn’t even attempt to build a raft. They are one of mine too, just so versatile. I’m glad you feel this salad is good enough for you to strand yourself on an island. Prove it. It sounds delicious and a salad I will be happy to eat for my lunch or for my dinner! Chorizo and potatoes are a perfect match! They are indeed and I love both equally. Perfect salad, made a large batch and enjoyed it twice this weekend with friends at bbq time. Great – I hope it went down well with all. Oh this looks fantastic! I’ve got both chorizo and potatoes on hand. I think I will make this salad this week. Delicious! Please do, Karista – and enjoy it! Loving your food at the moment! Just made this for dinner, made a couple of changes based on the pantry – swapped potato for sweet potato and red pepper for tomato and it was delicious! Went down a treat in my flat of men!